Patella aspera and Patella candei are two abundant limpet species commercially exploited and often used as a delicacy in the Madeira Archipelago, but there is a lack of scientific knowledge about these species. This study investigated the nutritional value and fatty acids of this species across the coast of Madeira Archipelago. The lipid content (7.71–12.60% dw), proteins (48.22–64.09% dw), ashes (11.12–23.12% dw) and carbohydrates (4.5–10.9% dw) were determined in P. aspera and P. candei at different collection sites. In the fatty acid composition, a total of 23 fatty acids (FAs) were identified. 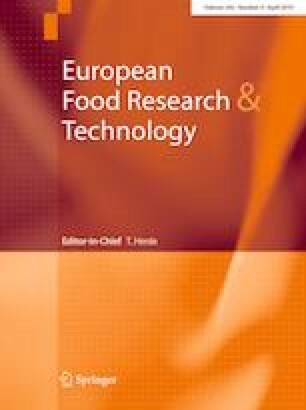 P. aspera showed the highest amount of monounsaturated FAs (MUFAs, 35.02%) and eicosapentaenoic acid (EPA, 12.59%), and P. candei presented the highest level of oleic acid (OA, 28.25%), polyunsaturated FAs (PUFAs, 27.26%) and arachidonic acid (AA, 11.38%). The Σω3/Σω6 dietary ratio presented levels > 0.25 suggesting that these marine molluscs are a good source of ω3 for dietary intake. Within each specie significant differences (p < 0.05) across sites were observed. High amounts of essential nutrients were shown in Patella species collected at Selvagens site while poorest levels were shown in Patella collected at Lido. The evaluation of the nutritional traits of P. candei and P. aspera shows that these limpets are good sources of essential fatty acids for human health and that the distribution of limpets is a key factor when determining its dietary value. This study was partially supported by the Oceanic Observatory of Madeira (M1420-01-0145-FEDER-000001-Observatório Oceânico da Madeira-OOM).